Sumitomo Special Metals Co., Ltd. (Sumitomo) and AOMag concluded a Patent License Agreement dated March 6, 2000 regarding the manufacture and sales of Nd-Fe-B type anisotropic sintered magnets. Sumitomo have entered into a Cross-License Agreement with Magnequench that covers their respective Nd-Fe-B magnet patents. 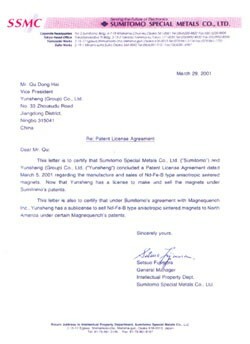 Under this Cross-License Agreement, Sumitomo have a license under the Magnequench patents in the United States with respect to sintered Nd-Fe-B magnets. Most of Sumitomo's licensees(including AOMag) are also covered by this license with respect to Nd-Fe-B patents held by Magnequench. AOMag, an innovative, leading manufacturer of permanent magnets worldwide, is ISO certified and owns the Patent License from Sumitomo Special Metals Co. for the manufacture and sale of Neodymium magnets across Europe, America and Asia. 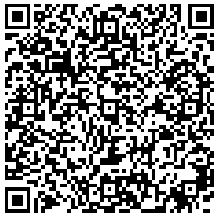 Based in Ningbo, China, we are the market leader in permanent magnets and magnetic assemblies technology. We develop and manufacture a full range of Neodymium products including high grade, high energy magnets such as N52, 50M, 48H, 45SH, 38EH, etc. Applications supported include: linear servo motors, generators, sensors, automotive components, acoustic equipment and green energy products. AOMag is a proud business member of American Wind Energy Association. We supply licensed sintered and bonded Neodymium permanent magnetic materials and assemblies to wind turbine manufacturers. Sumitomo holds many patents on Nd-Fe-B magnets and magnetic materials. Although some Sumitomo patents will begin to expire in 2003,other Sumitomo patents relating to Nd-Fe-B magnets will not expire until 2014. *Covers Nd-Fe(,Co)-B anisotropic magnetic materials. **USP 5,645,651 covers a compound having tetragonal crystal structure and is valid until July 8,2014. The validity and enforceability of this patent were verified in the US ITC proceeding where Sumitomo and Magnequench jointly won the exclusion order. This patent applies not only to Cocontaining compounds but also to compounds not including Co and/or compounds with additives such as Dy. Use of sintered Neodymium magnets, either as an individual magnet or in an assembly, without license is prohibited by the Patent Law of the United States of America. All sintered Neodymium Iron Boron magnets supplied by Stanford Magnets Company are licensed. If request, we can supply Licensed neodymium magnets to our customers. The territories of sumitomo patent include the United States, Canada, Europe, Southeast Asia and other countries. The licensed neodymium magnets is more expensive than neodymium magnets without patent, the price difference is about 8%-50%. The patent fees are different for different countries. If you want to order licensed neodymium magnets, please contact us with your complete information like company name, address, destination, shipping port and specific requirements.